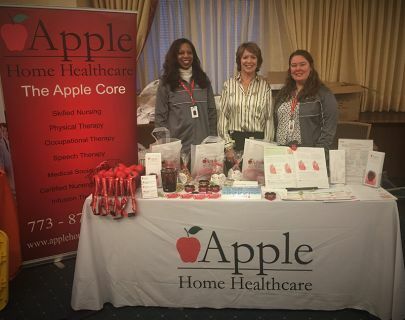 As a Tier 1 Preferred Provider at Northwestern Memorial Hospital, Apple was pleased to participate in the 2019 NMH Care Coordination Vendor Fair at the Feinberg Pavilion on March 20. Members from the Apple Team welcomed the opportunity to connect with the NMH care coordination team; a team that is committed to ensuring that NMH patients continue to receive the best care and outcomes upon their discharge from NMH to their home setting. Tier 1 Preferred Providers are vetted and selected by Northwestern Memorial Hospital based on a number of factors related to health outcomes and excellent patient care feedback. Team Apple strives to make every patient’s transition to their home setting as seamless as possible. Call Apple today at (773)871-8700 to learn about how we can help you or your loved one recover comfortably in the home setting. We serve an 11-County Metropolitan Area in and around Chicago. Cook, DuPage, Will, Lake, McHenry, Boone, Kane, Kankakee, DeKalb, Kendall, and Winnebego Counties. Apple Home Healthcare has the highest standards for quality care to enhance our patients’ quality of life. We have been living up to these standards for over 20 years, and continue to deliver exceptional care to our highly satisfied patients every day.